Part of the stretch where a cable barrier will go: Looking north from the Grand Prairie overpass. 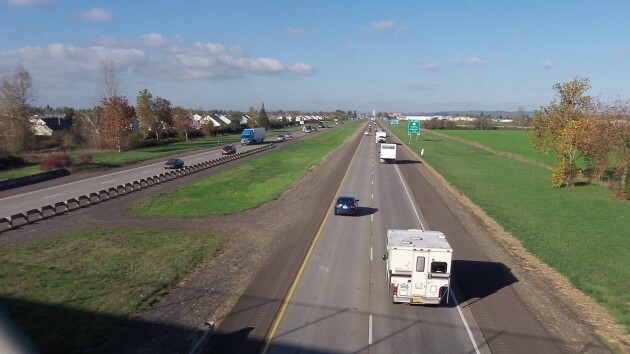 By next spring, Interstate 5 through the mid-Willamette Valley should have a cable barrier down the median to keep cars from crossing into the opposite lanes and killing someone. As you may recall, after two fatal cross-over crashes, one near Albany and the other in Salem, Governor Kitzhaber last month had a talk with Matthew Garrett, director of the Oregon Department of Transportation. Garrett then instructed his department to hire someone right away to extend the cable barrier that had been installed in much of Lane County the year before. ODOT sprang into action, and last week it announced that it had signed a contract with K&E Construction of Salem. For about $7 million, the company will install 42 miles of median cable barrier in Linn and Marion counties. ODOT said it had intended to get this done during the 2015 construction season but moved the project up in response to the emergency declared after the two cross-over crashes, which killed three. Construction should start by the end of November. According to ODOT, the contractor plans to do the Salem project first and finish it by the end of January. The company hopes to complete the barrier in Linn County by mid-March. In both segments, the work includes the removal of median berms. In Salem, the barrier will be built from milepost 253 near the Mission Street interchange to MP 260 near the Chemawa Road interchange. In Linn County, the new barrier will extend from where the existing one ends at milepost 209, near the Harrisburg exit, up through Albany to MP 245 near the Jefferson Highway interchange. ODOT said a short section of freeway in Lane County, near Camas Swale Creek at milepost 185, also will get the cable barrier.